Old Fashion Lilac Shrubs, Syringa vulgaris, bears large lilac fragrant blossoms in April to May. This Lilac flowering shrub is perhaps the most popular of all lilac shrubs due to its rich color ranging from purplish red to lavender and purple shades. 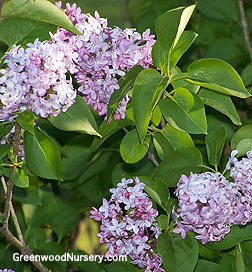 The Old Fashion Lilac has extremely fragrant flowers with a broad, rounded habit plant shape. A plant native to southeastern Europe. The lilac flowering shrub a moderate growing shrub with attractive dark green foliage. It is great for hedges, or screens, and can also be planted as a specimen plant. As with most lilacs, the Old Fashion Lilac Shrub is a cold weather shrub and does not perform well in the south due to heat and humidity. Common Lilac Bushes grow up to 20 feet in height and 6 - 12 foot spread. They may take up a large space with time. Old fashion lilac has moderate water requirements, and a moderate salt & alkali tolerance.